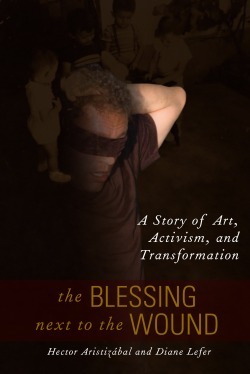 This aptly titled book draws a spiritual path to transcend physical and psychic wounds, whether they come from political persecution, domestic abuse, gang violence, exile, or poverty.In this remarkable and powerful personal narrative, Hector Aristizabal portrays his own transformation—from a torture victim to a spiritual guide strong enough, artistic enough, and, ultimately, blessed enough, to lift other lost souls into the light. Read what tatiana de la tierra wrote about the book and us here, in La Bloga. The Blessing Next to the Wound is available in both print and e-book editions, at Lantern Books or your usual source, brick-and-mortar or on-line booksellers. Click here to order from Amazon. composite photo by Nick T. Spark, from performance of Nightwind.